People across the planet everyday suffer with foot pain and backache due to inefficient arch support. And as a result, the rising demand for better improved insole fit and function means that the large market for foot orthotics continues to expand at a rapid rate. Whilst conventional methods in the manufacture of advanced custom orthotics are costly and time-consuming, 3D printing offers a welcome solution for design iteration and verification during the development stage. Stratasys, having worked with Altair Engineering alongside the University of Michigan Orthotics and Prosthetics Centre to develop better foot orthotics for veterans using 3D printing technology, were an obvious choice for medical equipment supplier Peacocks Medical Group when they sought a way to utilise 3D printing in the large-scale production of custom orthotic solutions. This partnership has allowed the companies to join their expertise and introduce Podfo, which are orthotics built through Selective Laser Sintering (SLS) 3D printing technology. With the ability to produce intricate designs and complex geometries, this technology enables multiple feature variations in one device. 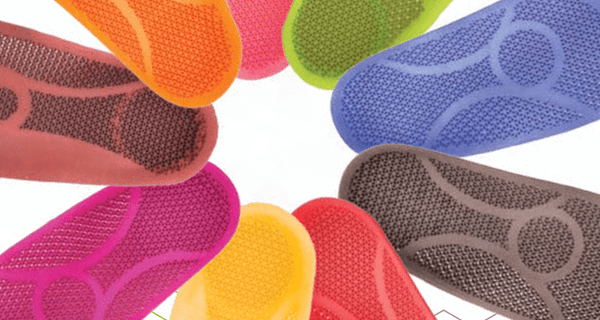 This not only introduces next-level customisation, but also eliminated the need for pads, foams and top-cover as deemed necessary in traditional orthotics. Peacocks’ Podfo line offers patients increased mobility, pain relief and an experience centred on their needs- where the customer is at the heart of the design. Using NYLON 11 FDM material, Peacocks had to be certain that the Podfos design would withstand the demands of everyday wear for years to come, and so the material was put through rigorous testing that involved 10 million cycles of durability and flex tests. The final products offer a thin, lightweight, comfortable, and accurate fit. Ultimately allowing for patient mobility like never before, increased independence and that much-needed relief from foot aches and pains. The 3D printing method introduces advanced, complex and customisable designs. Offering precise flexibility and control across all areas of the sole. “In a field like medicine where customization is key, our work with Podfo perfectly exemplifies how 3D printing produces highly specific solutions to improve a patient’s quality of life. We’re putting the power of 3D printing to work with Podfo – delivering medical solutions that significantly improve clinical outcomes of the most complex foot ailments,” said Scott Rader, General Manager of Medical Solutions at Stratasys. Podfo’s offer varying flexibility within its design, steering the direction of force and pressure centre with the wearer’s movement. Thus allowing patients to embrace the natural movement with full foot support. Custom-made to each patient’s individual prescription as well as their plantar surface, Podfo’s are not only perfect for everyday use, but also sports applications because they are hygienic, waterproof, washable, and near 50% lighter than conventional orthotic device designs. The Podfo line has been specifically designed to meet the needs of the patient, and they are only available on prescription of podiatrists and other healthcare professionals. The process begins when the healthcare professionals sends the patient’s corrected foot geometry, either in scan format or an impression foam or cast, to Podfo. The company even allows for UK healthcare professionals to mail any of these directly to Podfo, or scan the cast or impression over in a file. Podfo Ghost Medial Arch Stiffener: designed for patients with a stable fore-foot who would benefit from mid-foot and rear-foot control, but want a comfortable device and more natural progression to toe-off. Podfo Promo Pronatory-Moment Orthotic: reduces pain and pressure in the knee’s medial compartment by influencing lower limb biomechanics, encouraging greater pronation. Podfo Sumo Supinatory-Moment Orthotic: reduces pain and pressure in the knee’s lateral compartment by influencing lower limb biomechanics, and promotes foot inversion and supination. Podfo Progressive Flex First Ray: can replace a traditional cut-out with a more comfortable, flexible element, or be combined with stiff shell or Podfo Ghost in order to create a custom orthotic, able to help with any condition that requires first ray compliance. With traditional manufacturing methods, customisation in the medical device space is difficult and costly. With advancements in 3D printing in recent years 3D printing has made important breakthroughs in the medical field.